A worker cleans medical devices at Sterilmed's reprocessing facility. Intermountain Healthcare and devicemaker Ethicon, a subsidiary of Johnson & Johnson, are partnering to reduce waste by improving the reprocessing cycle for medical devices. The practice saves money and informs improvements on the design of products. The collaboration began to take shape after Cincinnati-based Ethicon acquired Sterilmed, a Plymouth, Minn.-based company that reprocesses and remanufactures medical devices, in 2011. The combination of an equipment manufacturer with a device reprocessor made J&J executives realize the cost-efficiency and environmental benefits that could come with an improved reprocessing service and more collaboration between providers, Ethicon and SterilMed. So, Ethicon signed a long-term agreement in September with Salt Lake City-based Intermountain, which is known for its supply chain practices. The companies work together to improve sustainability in a circular approach, with each assessing the other's process to see where improvements can be made. Purchasing reprocessed devices generally saves providers between 40% and 50% as compared to buying a new product, according to Kathy Werner, a director with FTI Consulting. It's typically smart to reprocess any devices that can be guaranteed to match the quality of a new product after reprocessing, she said. 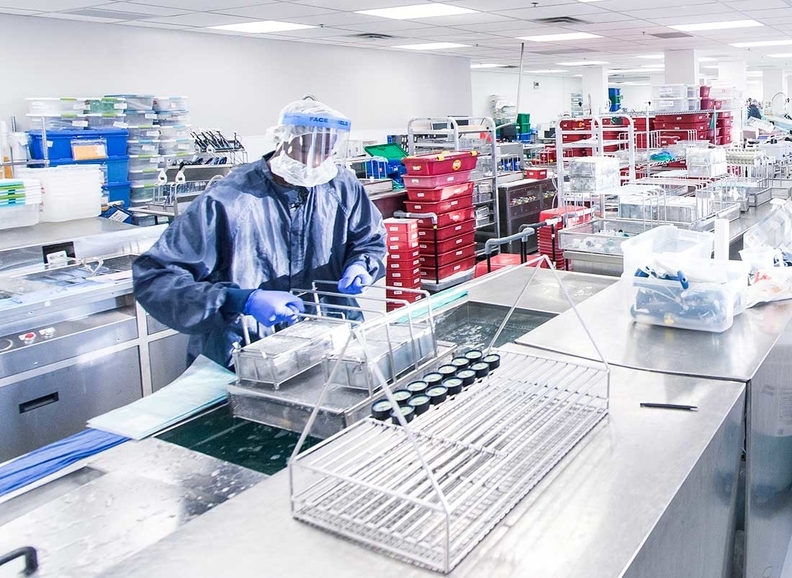 Through the partnership, Intermountain has learned how technicians can improve device cleaning to ensure the devices are in good condition when they eventually are reprocessed. Ethicon learns how to better design and manufacture devices to prolong their use and allow for more efficient reprocessing by Sterilmed. Both companies are also looking to improve sustainability in packaging. Reprocessing isn't possible for all products, and in some cases, it can leave supply shelves empty because not enough products arrive in good condition. That's where collaborative learning can drive efficiency and savings for both sides. But to ensure that reprocessing is consistent across a hospital's departments, companies must engage doctors, who may be unwilling to use reprocessed devices after one negative experience or if they're getting pressure from a manufacturer to buy new products, said Sudhi Rao, managing director in FTI's health solutions practice. In that case, providers and vendors must underscore the quality of the reprocessed supplies. Intermountain and Ethicon say they've diverted 260,966 device units from landfills and reduced the amount of medical waste going to landfills by 59,964 pounds, saving over 1,858 gallons of gasoline and reducing carbon dioxide emissions by 35,978 pounds. Bergstrom noted that recyclable products can provide similar benefits to reprocessed units, but they still eventually lead to some waste. While sustainability means higher upfront costs, it's often good business because it reduces waste and improves efficiency in the long run. It's not just good PR. Steve Bergstrom, Intermountain's director of sustainability, said he's been able to show a return on investment in nearly all of the sustainability projects he has tackled during his six years at Intermountain, with very few being good decisions solely from a moral standpoint. The partnership with Ethicon has already been able to save the system roughly $250,000 in the reprocessing of electrosurgical units alone, and Intermountain has saved about $27,000 by avoiding landfill costs for all devices. Tim Lessek, senior marketing manager at Ethicon, declined to name other providers, noting that there is not sufficient time to obtain their permission.